But Brett and his team weren’t out hunting bad guys on foot. Brett spearheaded an elite US military drone targeting team. Drones are unmanned planes that a pilot controls remotely. US military drones are different animals. They can glide through the sky at 300 miles/hour…. carry 4,000 lbs. of bombs… and cost up to $17 million apiece. From a safe room in Creech Air Force Base, Nevada, pilots like Brett use drones to hunt terrorists 7,500 miles away in Afghanistan. In fact, the US Air Force now employs more drone pilots than actual pilots! It’s growing faster than any military stock I’ve ever seen. And it’s set to soar as it wins billions of dollars in defense contracts over the next few years. It paid Lockheed Martin (LMT)… Boeing (BA)… Raytheon (RTN)… and Northrop Grumman (NOC) a staggering $118.1 billion. While this is nauseating for those of us who pay taxes, it’s a wonderful thing for companies that sell products and services to the government. As you saw above, both have crushed the S&P 500 for many years. But I’m not recommending you buy either today. They also enable other cutting-edge equipment like Patriot missiles, F-16 fighter jets, and the Navy’s “track and destroy” combat system. As I explained a while back, computer chips are the “brains” of electronic devices. Mercury’s state-of-the-art chips give drones a God-like view of the terrain below. They allow the drones to process what its cameras see in real time. As I mentioned, the American military relies on drones these days. It controls a fleet of 11,000 of drones… compared to just a handful 20 years ago. 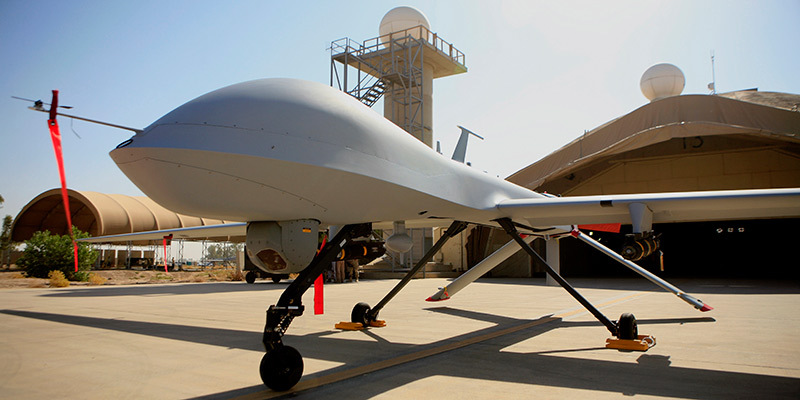 In fact, drones make up over half of Department of Defense aircraft today. Spending on drones is growing faster than any other military program and will hit a record $9.5 billion this year. Roughly 95% of Mercury’s sales come from the US government. And it stands to collect billions more as it wins military contracts in the coming years. 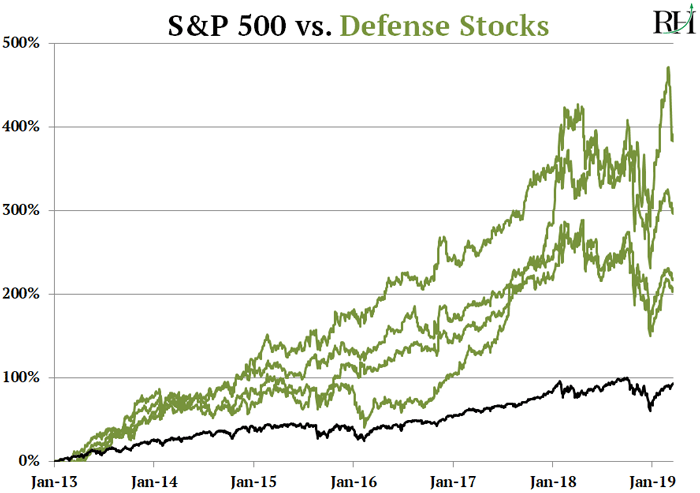 Earlier I mentioned that defense companies that sell to the US government have been great stocks to own. 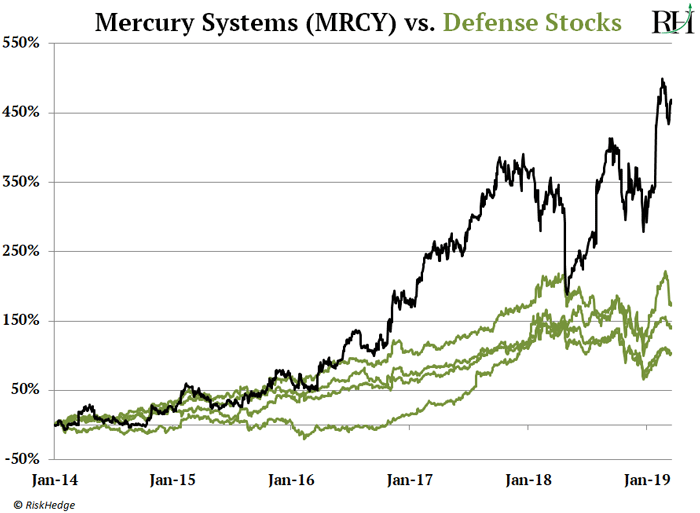 Well, in the past five years, Mercury’s performance has crushed all those big defense stocks. 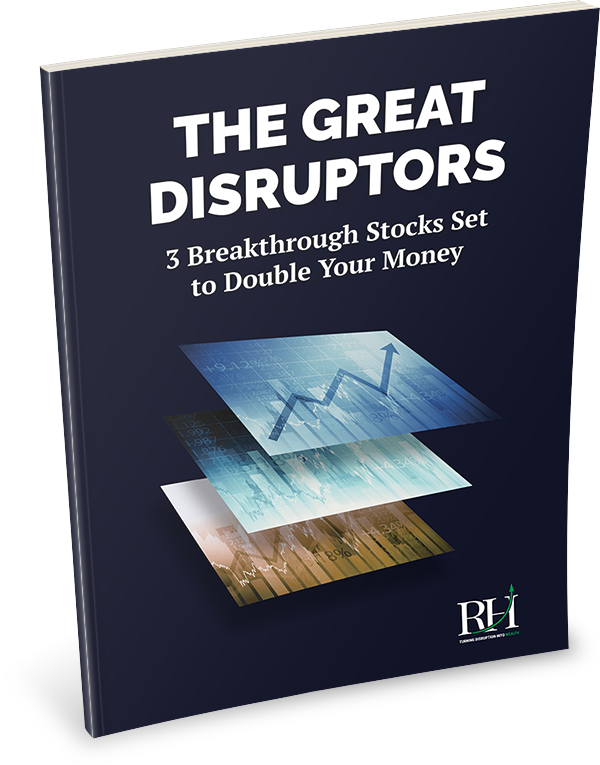 It has achieved these gains by growing sales 163% in the past three years. That’s 6.5x faster than Lockheed Martin… and 8x faster than Boeing. Mercury Systems has been on a tear since the start of the year, soaring 24%. Because it has climbed so quickly, I wouldn’t be surprised if it takes a short-term breather soon. But as military spending on drones and other cutting-edge equipment explodes over the coming years… I see Mercury’s stock climbing much higher. First of all I really want to thank you for your weekly letter, I find it very helpful. Is it bad if I invest in both Nokia (NOK) and Ericsson (ERIC) or should I choose one? Is one superior to the other? Lorenzo, thanks for your question. As I mentioned a couple of weeks ago, with Huawei out of the picture, Nokia and Ericsson are the only companies that can build the infrastructure needed to upgrade networks to 5G. As of 2018, Ericsson had a 27% market share of the mobile infrastructure market. Nokia was slightly behind at 23%. If you dig into both companies, you’ll find they’re quite similar. Their sales growth margins are all right around the same levels. Their stocks have moved in tandem over the past six months, too. Because there’s not a clear winner between them, it’s reasonable to take a small stake in both.